Failed to load tileset data? Discussion in 'RPG Maker VX Ace' started by AllyJamy, May 12, 2017. So this basically started when i copied my project over to a hard disk, because I was resetting my PC. 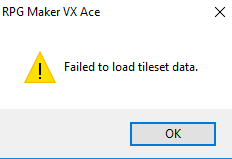 Suddenly this message "Failed to load tileset data" started coming up and I can not open my project or game. I've looked for solutions to this problem such as replacing the tileset data with a clean one. To no avail. It doesn't look like any of my tileset files are damaged, so I don't know what the problem is. some of your project files have been damaged while being copied - you can try to copy them again or try to replace the given file with the version from a new project. Yep thats what I figured. It doesn't say anything about what file is damaged though. and they all look fine after sifting through them. I've just done a clean install of windows 10 and rpg maker now aswell. and copied my project from my hard disk over to my PC, but its still acting up. The only thing it could be is the photoshop files I have in my graphic folders. But I don't see how that could affect the tilesets. I remember some errors coming up for some files when I was copying it over to the hard disk, but I just dismissed them as a common error at the time. I don't remember which files that came up though. It doesn't say anything about what file is damaged though. wrong, that's why I pointed you to the message. Failed to load tileset data means that the file tilesets.rvdata2 inside your data folder is damaged - all files are named after the data they contain. Okay. Is there anything I can do to fix it, apart from replacing the tilesets.rvdata2 with a clean one? Because that hasn't seemed to have worked. if exactly the same thing happens (with exactly the same error message and not one pointing to the next damaged file), then either the replacement file was damaged as well or it was one of the other two causes. Yep, exact same error. So it may well be the project file itself thats damaged. Is there anything that can be done about that? same way as any other file: replace it with a clean version from a new project. Nope, that hasn't seemed to work either... thanks for the help anyway! If all else fails, create a new project, and slowly copy in over your database stuff from your old project, one by one, and keep checking if it works until you find the culprit. Hopefully by then, you have copied at least the bulk of your project. It's probably attempting to load the tilesets from a location that they don't exist in anymore. Delete the tilesets from the database, then reimport them. I had this problem once, and that's how I fixed it. That may not be your issue, though. Just saw you said you can't open the project. Yeah, you're going to have to copy your project piece by piece into a new one like @Celianna said. Thanks for tips guys, I'll try them out. So yeah. It was the animation data that had messed up for some reason. Everything else was fine for the most part. Thank you for the help everyone.